f your career isn't working for you anymore, join my 5-day Career Happiness Challenge, designed to help you shift your thinking and uncover new possibilities. The challenge will run from September 24-28. Even after working with hundreds of clients, I still firmly believe that career satisfaction is possible. But it takes work. We change. Our workplace changes. Who we work with changes. And the world around us changes. So career isn't so much about the perfect job forever... rather it's a constant navigation of finding what works for us at the stage that we're at. I'd love to have you join me. Sign up here: http://eepurl.com/dGarqP to follow along. I can't wait to see where the next step in your career path takes you. Over the past few weeks, I’ve been asking myself some hard questions about my career. Am I putting energy in the right places? Am I living according to my values? These conversations are challenging, but they are important to staying aligned in my business, work, and personal life. A conversation that I often have with my clients is about how to define career. We often want to give career that narrow definition of just being our paid work, but really career is about how we want our life to be. It’s the work we do, paid or unpaid. Where we volunteer or contribute in the community. The educational opportunities we pursue. How we spend our leisure time. In 2017, I said “Yes” to everything and it ended up being the most amazing year. But in 2018, my commitment is to be more intentional and focused on building a career and life that is life-giving and sustainable. 3. What do I want my life to look like? Three years ago, when I first realized that I needed to make a career move, I felt lost, overwhelmed with options (or some days, lack of options) and a bit lonely in the process. I knew that a change needed to occur, but what that change was or how to get there was unclear. The turning point was when I started to find my community. Having honest conversations about where I was at and getting input from trusted mentors gave me a glimmer of hope and excitement for the future. This eventually sparked the birth of my company, Career Story. I believe that we shouldn’t have to figure this out alone – finding a community can make that critical difference and open new possibilities that you hadn’t even considered. If you find yourself ready for a career move, but feeling alone, I'd love to hear from you. Early in my career, I had the worst interview of my life. Looking back, I was over-confident. As a new career professional, I thought I knew exactly what I was doing. After all, I teach this, right? I skipped the practice and made a mediocre attempt to research the company. Big mistake. I walked away from the interview, embarrassed by how under-prepared I was. What I hadn’t factored in were my nerves. In a normal situation, I would have been fine. But in the interview, I found myself at a loss, unable to articulate what I wanted to. What I learned is that I can push past the nerves when I am prepared. Last year, I interviewed for a cool part-time contract job at a local university. (Read more about that here.) This time, I was ready. I reflected. I practiced. I researched. And it paid off when I was offered the position. If interviews are anxiety-provoking experiences for you, don’t give up. Interviewing is like building a muscle. The more you use it, the stronger you get. Having worked with hundreds of clients, I have witnessed incredible interview transformations. Even the shyest job seeker can master interviews and land jobs through practice. Here are my top eight tips for a successful interview experience. 1. Share your stories: Stories evidence how you have excelled in the past. 2. Make the employer feel special: Employers want to hire people who want to work for them. You may just want a job. But an employer wants someone who is as excited about their business as they are. Surprisingly, many job seekers struggled to answer this well. But don’t fall into the trap of memorizing the company website. Provide a thoughtful answer that clearly shows you did your research while also demonstrating your motivation, interest, and connection to the company and the job. 4. Practice, practice, practice: Interviewing isn’t natural to most people. But I have seen clients improve significantly after working hard on their interview skills. Get interview coaching, build some interview question flashcards, or record yourself answering the questions. 5. Speak naturally: Time and time again, I meet job seekers who are fabulous communicators and bring great energy when NOT interviewing. But as soon as we start practicing interview questions, they change their communication style. It becomes stilted and awkward. 6. Pause: After each question is asked, take a moment to gather your thoughts. Think about what the underlying skills or aptitudes the interviewer might be looking for and then make sure you address those. Also, if you launch straight into your response without a natural pause, it sounds too rehearsed. 7. Recover gracefully. You bomb a question. Don’t worry. It happens - it’s not the end of the world. What’s important is how you recover. Employers are also assessing your soft skills like resiliency, problem-solving abilities and how you keep calm in a difficult situation. 8. Prepare thoughtful questions for the employer: The point of asking questions at the end of your interview isn’t to look smart. These questions should help you in your decision-making process. What do you need to know so that you can make an informed decision? Some job seekers research obscure information from the company’s website and base their questions on that. Or they spend their time talking about logistics like vacation pay or benefits. Don’t do that. Instead use your valuable time to ask questions about things that would directly impact you such as the job structure, tasks, and company culture. Once you have done what you can to prepare, go to your interview, knowing that you have given it your best shot. You know that your upcoming interview might include technical questions – often these questions can make or break your ability to successfully land the job. Don’t miss out on your next big opportunity. Make sure that you are fully prepared for even the toughest questions. Read on to find out more about how you can effectively prepare. Know Your Resume. Anything you put on your resume is fair game for the employer to ask about. Make sure that you can articulately speak to your experiences and skills. Never put anything on your resume that you don’t feel comfortable explaining or talking about. Research Terms from the Job Posting: Review the job posting carefully. Are there any terms or skills listed that you aren’t familiar with? Don’t just ignore those. Do the research to make sure that you have a solid understanding of what the posting is asking for. Identify Your Related Skills: You may not have exactly what the employer is looking for. But you might have something similar. Take inventory of what technical skills the posting asks for and then figure out your closest equivalent skills and experience. Practice, Practice, Practice: Interviewing is like a muscle – the more you do it, the stronger you will become. Google technical questions related to your field to create a question database. Create flashcards or book some interview coaching to hone your interview skills. 1. Understand the question: Ask for clarifying information if necessary before answering. 2. Use examples: If you have related experience, use those stories in your answer. If you are new to the field, you can use examples from your courses, labs, volunteer, or personal. But, keep in mind that employers will weight work and education over other types of experience. 3. Demonstrate your thought process: Employers are evaluating your thought process, not just the final solution you present. Lay out any assumptions that you might make in your decision making. Outline possible alternatives. Talk about why you would choose the route that you did. 4. Get clarification: If you aren’t sure about something along the way, ask for more information. 5. Stay calm: Yes, you want to provide the right answer. However, the employer is also watching to see how you act under pressure. Stay focused, polite, and calm even if you feel flustered. I talk more about staying calm during interviews here. 6. Organize your thoughts: Employers appreciate candidates who can clearly articulate their ideas. Present your ideas logically and coherently. 7. Focus on soft skills, too: The interviewer wants to know if you can do the job, but they are also looking for other skills as well such as openness to learning, teamwork, communication, curiousity, safety, and problem-solving abilities. 8. Be honest: If you don’t know, just say so. However, you might know something related so transition your answer to talking about what you do know. You could also mention your willingness to learn. 9. Write it out: If you are trying to explain something complex, it might make sense to draw diagrams or write out examples of your work. Also, if you have a portfolio, you could draw on tangible examples to illustrate your point. 10. Don’t get fancy: Go with the solution that is obvious – don’t try to come up with something brand new as you risk getting it wrong. In 2017, I did a survey of hiring managers (read more here, here, and here), asking them what their top resume turn-offs were. Their number one pet peeve was spelling or grammar errors. When I became a resume writer, I was terrified of having a spelling error on one of my resumes. Somewhere along the way, I stumbled upon text-to-voice software so I can listen to my work. Initially, I started using Siri on my phone and then eventually started using another free software program on my computer. It has saved me so many times! Recently, the Career Professionals of Canada published an article which highlighted my experience in using text-to-voice software in my business. To read more, go here. Resume Trends: What Do Hiring Managers Really Think? This is Part 3 of our series on What Hiring Managers Want in a Resume, based on a survey of 60 hiring managers I conducted with Lisa Stephen in October 2017. You can read Part 1 and Part 2 here. In the past few years, we have seen emerging trends such as more visual infographic resumes, integration of video, and personal websites/ portfolio sites. So what do hiring managers think of these approaches? There's no doubt, a well-done infographic resume is stunning. But is it enough to capture the attention of a hiring manager? Some of our survey respondents found the information overwhelming and they didn't find the graphs very useful. Though it's visually appealing, a few found it difficult to scan to find useful information. This type of format works well for creative, marketing, or design positions. We were curious to see if video resumes would be the next up-and-coming resume format. We asked if a video resume could be used instead of a standard resume in an application. The hiring managers said NO! They need to be able to scan information quickly. The rule of thumb is 5-10 seconds to see if a candidate is viable. Clicking and watching a short video is way too much work for them. Then we asked, "Could a video resume be used to enhance a standard resume?" And yes, 41% would look at a video resume but also want to see a standard resume first. The key here is that your standard resume needs to capture attention first. Only then will a hiring manager be willing to invest time in watching a video. A friend of mine was doing some hiring and she noticed that a number of candidates had portfolio sites, showcasing their work. We commonly see this for creative positions, but these positions were administratively-based. So we asked, "Would you look at a portfolio site if a client included a link in their resume?" And we found that 50% of hiring managers would be open to that. 39% said it depends and only 7% said no. Again, like the video resume, employers are open to looking at a portfolio site, but first, your resume needs to be good enough for them to consider you a viable candidate. What do hiring managers look for in a resume? We asked and they answered. 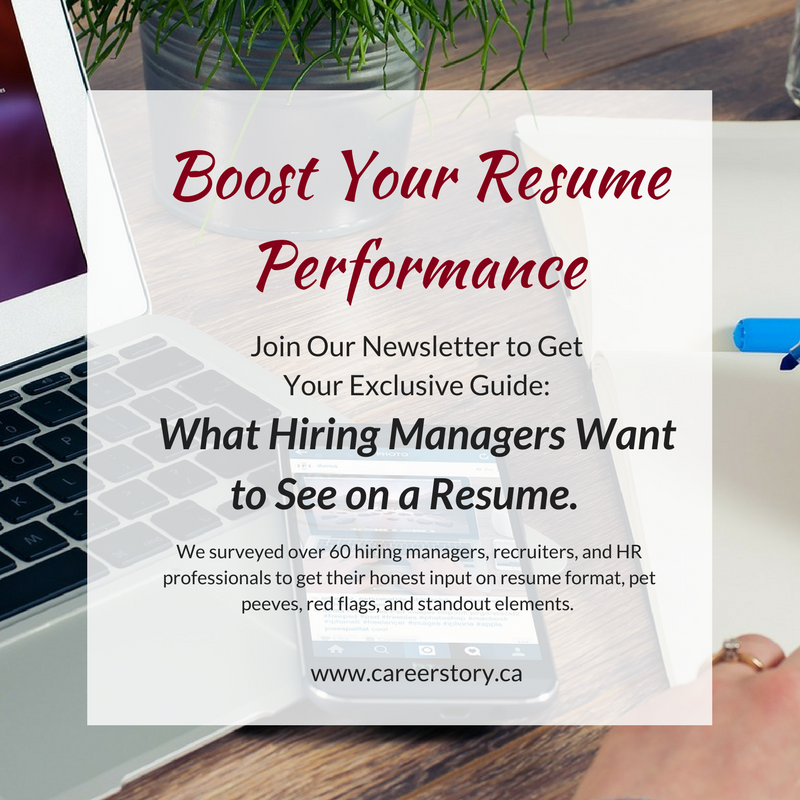 In October 2016, Lisa Stephen and I conducted a survey of 60 hiring managers across a variety of sectors, asking them about what their pet peeves, must-haves, and red flags were when it came to resumes. What do employers find most frustrating about the resumes that come across their desk? Spelling and grammatical mistakes topped the list. One employer shared that communication skills are critical in any job. The resume is the first indicator of whether a candidate has those vital communication skills. It’s also about respect – employers want to see that the candidate has put in an effort. Secondly, our survey respondents wanted to see resumes that were specifically targeted to the job they were applying for. Resist the temptation to simply apply to everything without changing your resume! And third, organization is key - content needs to be easy to understand and get through. We have such a short time to make a good impression. Employers are often scanning resumes for about 5-10 seconds. If we can capture their attention – show the connection to the work they are hiring for, they will take more time to dig into the content. If your resume is too hard to get through, it will get chucked. Resumes are not tailored to positions – which is one of HR’s pet peeves. Inundating HR with resumes that don’t show how you fit their role, is simply spamming. They all look the same. The Indeed format strips away formatting and design that can help you stand out. Indeed doesn’t give the option of using a targeted cover letter which is an important element in the application process. Instead of applying through Indeed, try alternative methods of applying like through the company’s website or via email. What causes the most amount of concerns for hiring managers? 59% of the employers we surveyed were most concerned when someone had a pattern of short-term employment. If that is you, it would be wise to indicate why. Perhaps companies closed, or the positions were contract positions. Anticipate what concerns the reviewer might have about your past work history and then ensure you address those in your application package. Because resume targeting is so important, it makes sense that 49% of employers get worried when they see unrelated experience to the job that you are applying for. You may have your reasons for applying to this position, but you need to clearly evidence why you are a good fit for the job. Gaps in employment or no recent employment are less of a concern than many people think. If you can provide a rationale, many employers are willing to still consider you as a viable candidate. You can put a short note on your resume and then also address it in your cover letter. What, then, is the key to an amazing resume? Having a beautifully designed resume can make a difference, but what do employers really want to see? Evidence of past work experience related to the job! No big surprise here. Your resume needs strong content MORE than it needs a sleek design or layout. Consider using bold font to help important information stand out. Other important insights from our employers regarding resume content and design. Resumes ARE the backbone of a strong job search. A well-crafted resume can greatly energize your job search and generate the opportunities that you truly deserve. In October 2017, I partnered with Lisa Stephen to put together a survey of over 60 hiring authorities including hiring managers, HR professionals, and recruiters across a wide range of industries. Google “resume page length” and you’ll find a variety of opinions. Our hiring managers had a clear preference for a 2-page resume. That being said, 30% of respondents say that it depends on the type and level of the job. We asked if employers wanted dates with only the year OR in the month/year format. We found that most employers (77%) wanted dates in the month/year format. If only the year is included, it is difficult for an employer to know if the applicant worked one day or 12 months in a specific role. How many years of experience should you include on your resume? We found that 49% of employers want to see up to 10 years of experience while another 21% look for about 10- 15 years of experience. Very few wanted to see more than 15 years or all of a person’s work history. Then, what’s the preferred format to get a resume in? 79% of our respondents preferred PDF while only 5% strongly preferred Word. The most important piece of advice is that you need to follow the instructions on the job posting! Most of our respondents didn’t care, though it seemed that sans serif fonts were preferred over serif fonts. The key here is that it’s easy to read! Stay tuned for Part 2 and Part 3 of this series. Kristin Vandegriend is the founder of Career Story where she has helped hundreds of her clients successfully transition to work they love. She is passionate about supporting her clients to uncover their strengths and communicate to get what they want in the workplace.